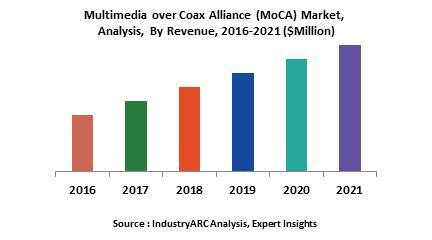 Multimedia over Coax Alliance (MoCA) is an alliance developing technology for connected home solution. The technology uses in-home and in-building coaxial cabling which aids in connecting all the consumer electronics devices making it a smart home. The technology helps in building backbone for wireless network. The major applications are multiroom DVRs, OTT streaming, and gaming. The MoCA group has currently 45 members including TV operators, OEMs, consumer electronics devices manufacturers and electronic IC vendors. The report gives detailed insights on the technology, its evolution, current integration ratio, and future opportunities. The report analyzes the different modes and versions of MoCA such as MoCA 1.1, MoCA 2.0, and MoCA 2.5. Each of these versions supports different speed ranges, such as 2.0 and 2.5 version MoCA supports 400 mbps, 800 mbps, to 2.5 gbps speed. The report also analyzes the compatible technologies and devices with MoCA technology such as Cable TV, Telco/IPTV, Satellite Communication, and Wi-Fi. The drivers and restraints for the MoCA market are also analyzed in the report extensively. Moreover, the report also identifies the different potential opportunities for MoCA market in coming future with respect to applications and geography is mapped. The comparative analysis of MoCA technology with its substitutes has been broadly covered in the report. The comparison is based on the technological specifications, reliability, cost effectiveness, speed of connection and so on. For each region, the country level analysis, market dynamics, drivers, restraints and opportunities are identified in the report. Besides, detailed analysis of opportunities in developing nations such as India and China is also covered in the report. The MoCA market is niche currently and only used in home application. There are very few companies globally currently adopting this technology. With the advent in technology, more awareness about the technology, and proper channeling of the product within the masses, it is expected that the technology will gain momentum in terms of adoption and the market will grow with high CAGR in coming years.